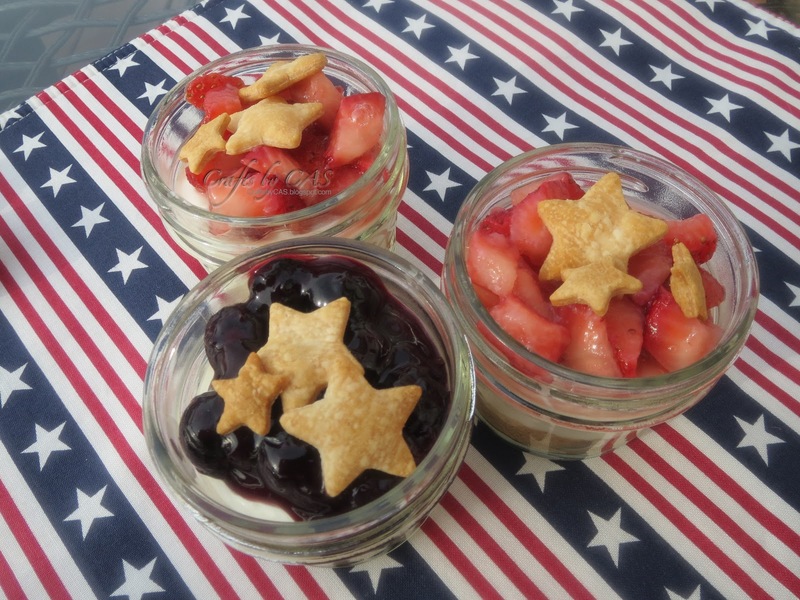 We had a small cookout get together on Memorial Day and I made these desserts. I love using these mini jars for desserts when the warmer weather comes. I need to start finding more recipes to use these little cuties with! Combine the blueberries and sugar in a small saucepan over medium heat. In a small bowl mix together the cornstarch and water until smooth. Stir berries occasionally as they begin to release their juices. Once mixture is bubbling, stir in cornstarch mixture. Continue to cook, stirring frequently until the mixture thickens. Remove from heat and stir in lemon juice and zest. Transfer to a bowl. Cover and refrigerate until ready to use. Combine the strawberries and sugar in a bowl and toss to combine. Let this stand for 1 hour, stirring a few times until the berries have released their juices. Cover and refrigerate until ready to use. Combine the cream cheese and Greek yogurt in a bowl. Beat the mixture on medium-high speed until smooth, about 1-2 minutes. Add in the confectioners' sugar and mix until well incorporated. Add in vanilla and heavy cream, beat until fluffy. Spoon the mixture into jars. Spoon topping onto cheesecake mixture. I cut mini stars from packaged Pillsbury pie dough and baked them until golden brown on a cookie sheet (next time I will sprinkle with sugar prior to baking) and placed them on top right before serving.